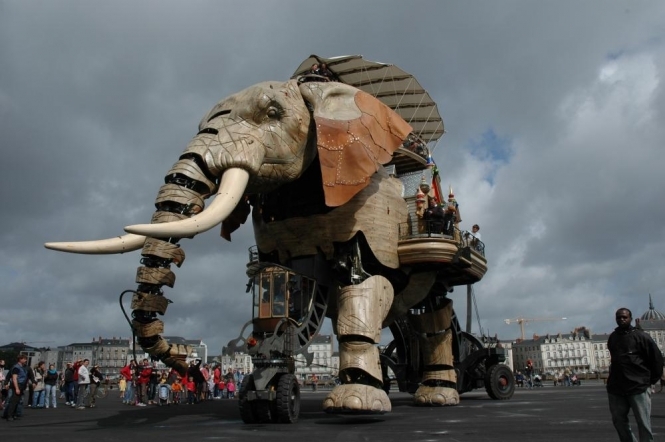 Nantes' famous mechanical Grand Eléphant will play an important role in helping preserve its real-life inspirations as it returns to the city's streets following a three-month €770,000 revamp. As reported, the Eléphant has been off parade since November 2017. The 48-tonne device has been completely dismantled and cleaned, given new ears - and its 420hp diesel engine replaced with a smaller and more efficient 150hp hybrid petrol and electric one. Its owners now hope that the newly refurbished creation, part of the city's Jules Verne-inspired Machines de L'ile attraction, will help raise €15,000 a year for Breton-based organisation Des éléphants et des hommes, which works to protect both Asian and African elephants. The money will go towards the development of a wild elephant over the past century. In neighbouring Burma, there are 11,000 elephants - which the organisation hopes means the downward trend in Laos can be reversed. According to the Worldwide Fund for Nature, meanwhile, there are an estimated 415,000 African elephants living in the wild. At the beginning of the 20th century, there were between three and five million.